So I don't know what's been going on, but I haven't shown a skirt or a dress on the blog in over a month. I also realized I've worn maybe one skirt to work in the two months I've been at the new job. I think it may be a little subconscious - for the first time in my working life, my office is primarily guys. It's a tech startup, and out of the fifty or sixty employees there are less than ten women. I think that maybe I was trying not to go too girly on all of the men. Now, that is a very silly reason to ignore the skirt and dress section of my closet and it seems a little anti-feminist to me, so I've been trying to make it a point to wear more of them lately. I actually think this might be a front runner to wear next week for Thanksgiving. It's a little dressed up but not overly so (our Thanksgivings are usually pretty casual) and something about the plaid and green feels festive. Thanksgivings are always a little crazy for me - this year I'm going to two on Thanksgiving Day, plus another lunch the day after Thanksgiving and a fancy party on Saturday night so I actually need to come up with a couple of things to wear. Having a style blog is actually pretty handy in that way, whenever I can't think of something to wear I just flip back through the archives to find something I like. Do you plan out your outfits in advance like me, or are you more of a spur of the moment gal? Linking up with Random Wednesday, Style Me Wednesday, Style Sessions, Trend Spin Linkup and Stylish Tuesday. 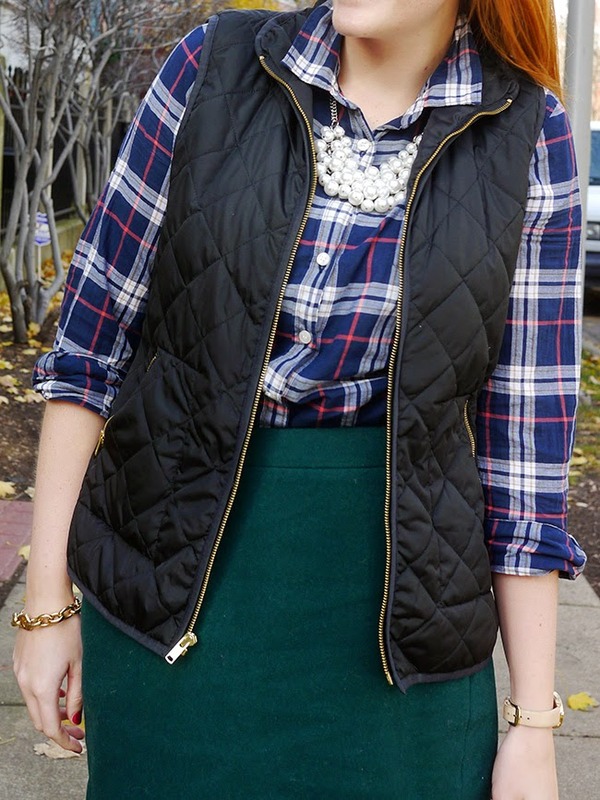 This would be the perfect outfit for Thanksgiving! 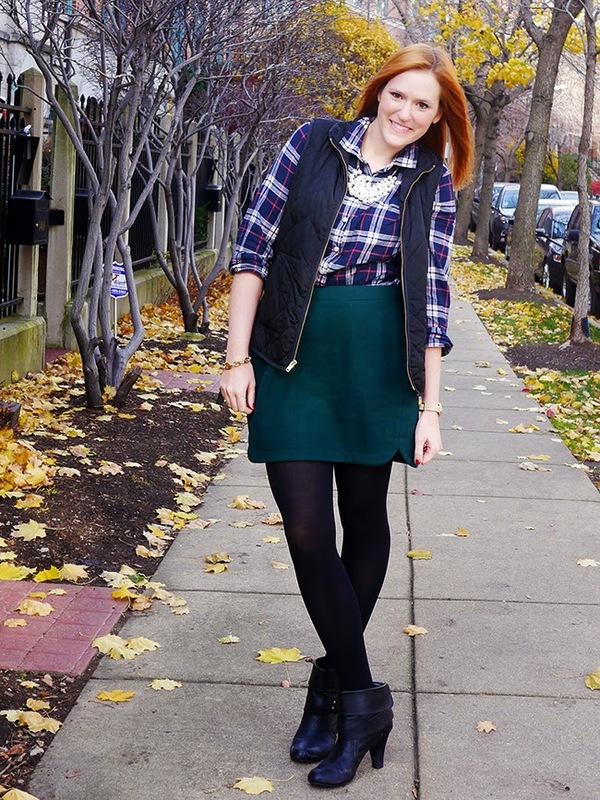 I'm loving that amazing skirt with your plaid top! I love these colors together! Such a cute fall look. I love this entire outfit! SO cute! Love the emerald green paired w/ the navy blue! Perfect combo for fall and winter! The color of this skirt is soooo pretty! I used to work in a tech start up environment as well, one of only two girls! I felt a little weird wearing my dresses and statement necklaces to work when everyone else was in hoodies...but I just went for it because that's what made me comfortable! You look great! I generally plan in advance - especially for work because I do not like getting up early at all. 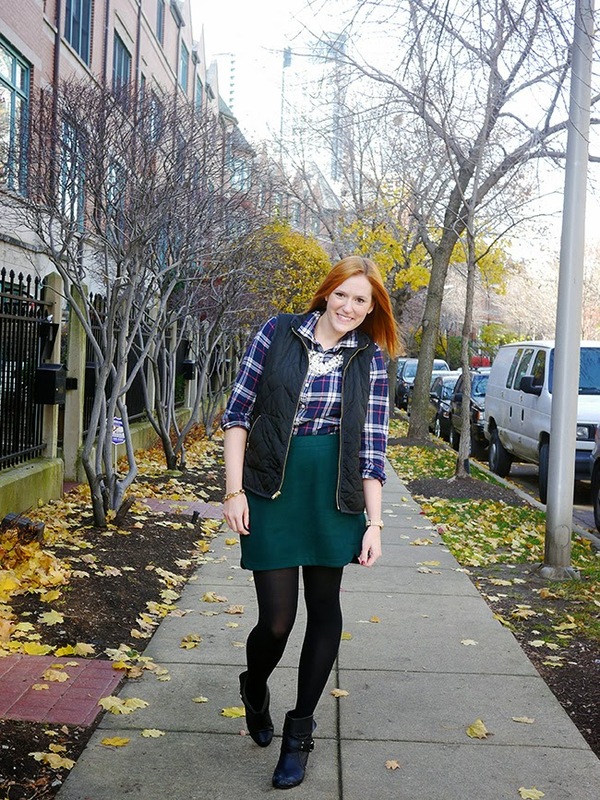 I've already been brainstorming some thanksgiving ideas as well, and I generally end up in a skirt! Love this combo for the holiday. I am a total plan-in-advance girl. On the odd days that I don't plan my outfit the week/night before, I stand in my closet and try on about 10-15 different outfits until I run out of time, and then I usually am in something I don't like all day and feel cranky about it, haha. I LOVE that necklace, by the way!